"A fresh salsa with the heat of jalapenos and the tang of fresh lime juice." 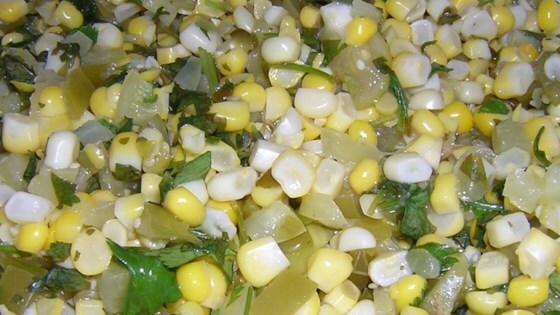 In a large skillet, combine the corn kernels and jalapeno peppers. Cook and stir for 10 minutes, until the jalapenos are soft. In a saucepan over high heat, combine the corn and jalapeno mixture with the tomatillos, green bell peppers, green onions, lime juice, water and coriander. Cover and bring to a boil. Reduce heat to low and simmer 5 minutes, stirring once. Remove from heat. Cool for 10 minutes. Stir in the cilantro. Allow the mixture to cool in the refrigerator. Serve with tortilla chips. Just off the stove, piping hot, this dish was fantastic. I left out the jalepeno to tone down the heat and my family really liked it as a side dish. Good but next time I would use less corn. It wasn't very liquidy. Extremely mild. My 3 year old loved it. This was a great salsa. I used tomatillaos from a neighbor who had too many. All of my friends raved about it. Easy to make and delicious.